45 Old Whitgiftians from the class of 1996 met for their 20-year reunion at School, at the end of the Summer. The group assembled on the Terrace and posed for a photo by the War Memorial (pictured) before heading up the Old Library for an informal buffet-style dinner where all were able to “mingle” and catch up at their leisure. After a delicious meal, delivered by the School’s caterers, the group travelled up to Whitgift Sports Club (“The Clubhouse”) to continue their reminiscing in the bar. 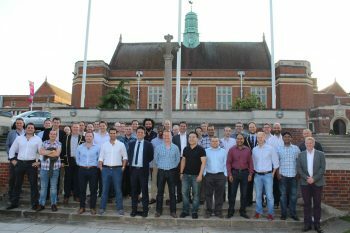 If you would like to organise a reunion for your year group, or any other group of Old Whitgiftians, please contact the WA Office on 020 8633 9926.